February may be American Heart Month, but really — getting kids to move and love exercise is always in season! Learning about exercise doesn’t have to be a lecture — make it fun with these engaging children’s books about exercise and physical fitness! In addition to recommending books about exercise for kids, I’ve teamed up with some fellow bloggers to offer you homeschool and classroom resources to teach kids about making healthy choices for American Heart Month! 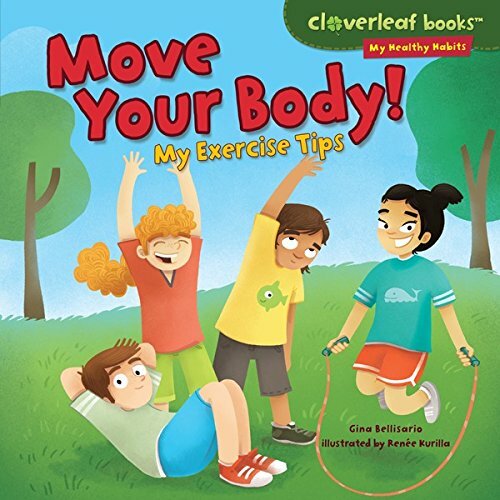 You can find these children’s books about exercise at your local library or purchase through the affiliate links provided for your convenience. 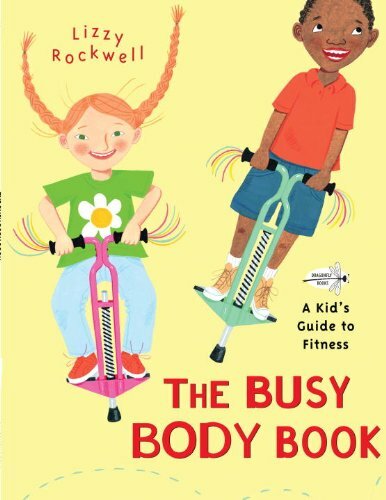 The Busy Body Book: A Kid’s Guide to Fitness: Your amazing body can jump, sprint, twist, and twirl. Your body is built to move. Lizzy Rockwell explains how your bones and muscles, heart and lungs, nerves and brain all work together to keep you on the go. Kids walk and skate and tumble through these pages with such exuberance that even sprouting couch potatoes will want to get up and bounce around—and that’s the ultimate goal. Studies show that American kids are becoming more sedentary and more overweight and that they carry these tendencies with them into adolescence and adulthood. Experts agree that we need to help kids make physical activity a life-long habit. Through education, information, and encouragement, this book aims to inspire a new generation of busy bodies! 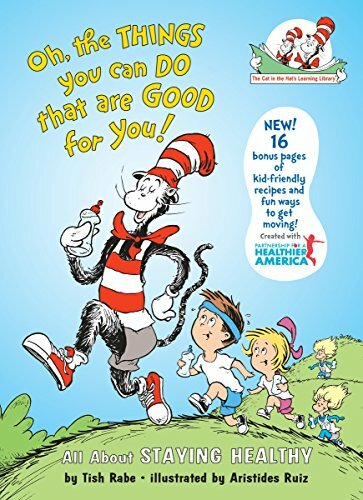 Oh, The Things You Can Do That Are Good for You: All About Staying Healthy (Cat in the Hat’s Learning Library): In this newly revised editiion—with 16 pages of bonus materials—the Cat in the Hat takes young readers to a Seussian Spa where they learn the basics of healthy living. Updated with the assistance of the Partnership for a Healthier America, the Cat explains the importance of eating right (based on the latest USDA MyPlate recommendations); staying active; getting enough sleep; handwashing; brushing and flossing; wearing protective gear when playing sports–even the best way to sneeze when you don’t have a tissue handy! The 16 pages of newly added backmatter include simple, fun suggestions for children to increase their activity thoughout the day, plus 8 kid-friendly, healthy recipes for parents to prepare for their hungry broods. An ideal choice for supporting Common Core Standards and fans of the hit PBS Kids television show The Cat in the Hat Knows a Lot About That!—this is a book that supports healthy bodies AND healthy minds! Good Night Yoga: A Pose-by-Pose Bedtime Story: Kids love yoga—and it’s great for them, so much so that the President’s Council has added the practice to the fitness activities in the annual President’s Challenge. 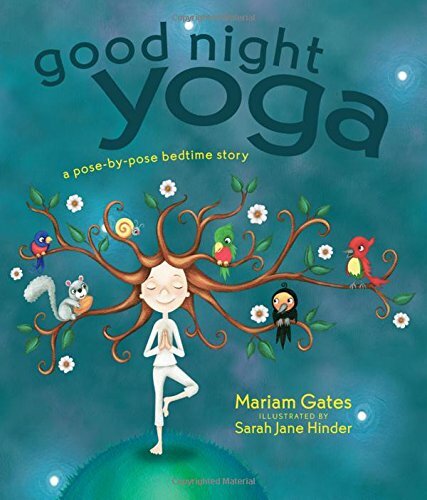 For parents and caregivers looking for a fun and effective new routine for bedtime, innovative educator Mariam Gates presents Good Night Yoga, a playful yet wholly practical book for preparing for sleep. 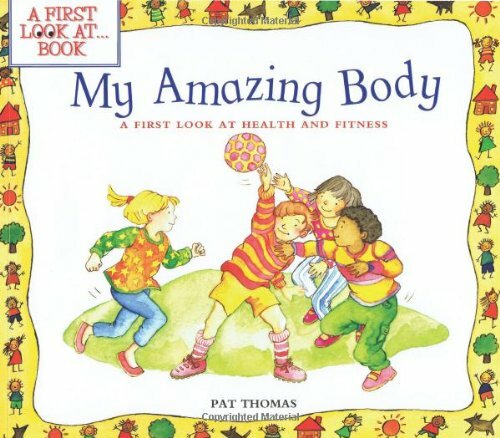 My Amazing Body: A First Look at Health and Fitness: Many aspects of health and physical fitness are explained in a way that younger children can readily understand. This lively picture book explores the importance of a good diet and plenty of exercise, and encourages kids to make positive decisions about caring for themselves. Kids discover that even healthy people get ill sometimes, but that our bodies have special abilities to protect us and restore our health. Titles in this series for younger children explore emotional issues that boys and girls encounter as part of the growing-up process. Books are focused to appeal to kids of preschool through early school age. Written by psychotherapist and counselor Pat Thomas, A First Look At books promote positive interaction among children, parents, and teachers, and encourage kids to ask questions and confront social and emotional questions that sometimes present problems. Books feature appealing full-color illustrations on every page plus a page of advice to parents and teachers. Move Your Body! 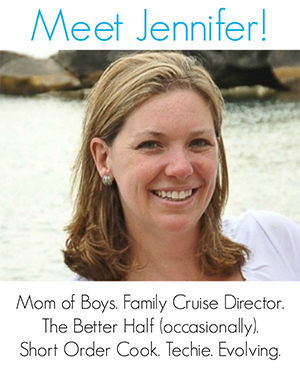 : My Exercise Tips: It’s almost Field Day! But Natalie’s team isn’t ready for the big race. Their muscles get tired easily. Ms. Starr teaches them about aerobic and anaerobic exercise. They learn some stretching exercises too. Now they’re full of energy. Can they win the beach ball relay? 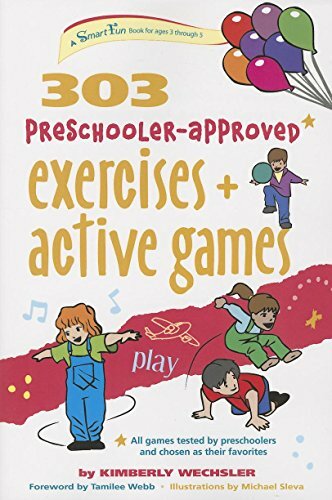 303 Preschooler-Approved Exercises and Active Games (SmartFun Activity Books): 303 Preschooler-Approved Exercises and Active Games is written specifically for children ages 2-5 years old. In the Building Blocks of Fitness section, each fitness and sport skill is taught in different stages. This allows teachers, counselors, or parents to teach their preschooler a skill that sets the foundation of a more difficult skill; the next level adds a new and more complex element. By doing this, the preschool child will be safe and will feel confident about themselves. Move! : Don’t read this book—play it! Introducing an ingenious way to help kids get the 60 minutes of active play they need each day. Move! is a book that combines imaginative play with movement. Hold it up to your face like a big pair of jaws and ROAR and STOMP like a dinosaur. Hold it by the die-cut handles to swing in a hip-to-hip motion while ROWING like a canoe. Or hold on tight and SPIN like a flying saucer. This inventive format will excite the imaginations of kids and parents alike. 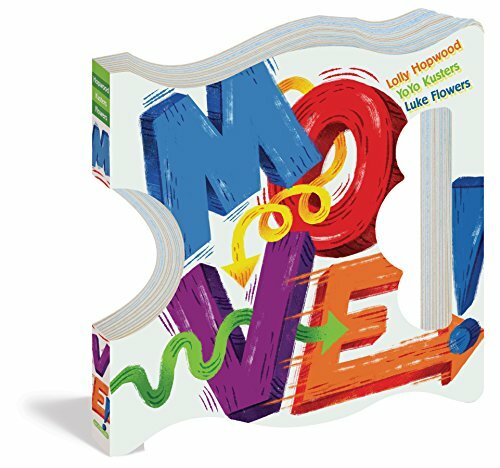 Lively rhyming text and colorful, spirited illustrations prompt young readers to perform physical activities utilizing the book’s die-cut holes and handles. Move! is a book that will foster a love for reading and a love for physical activity—a book designed to keep kids healthy, happy, and having fun. Like these books about exercise? Find even more engaging book lists for kids with more than 100 book-themed reading lists! 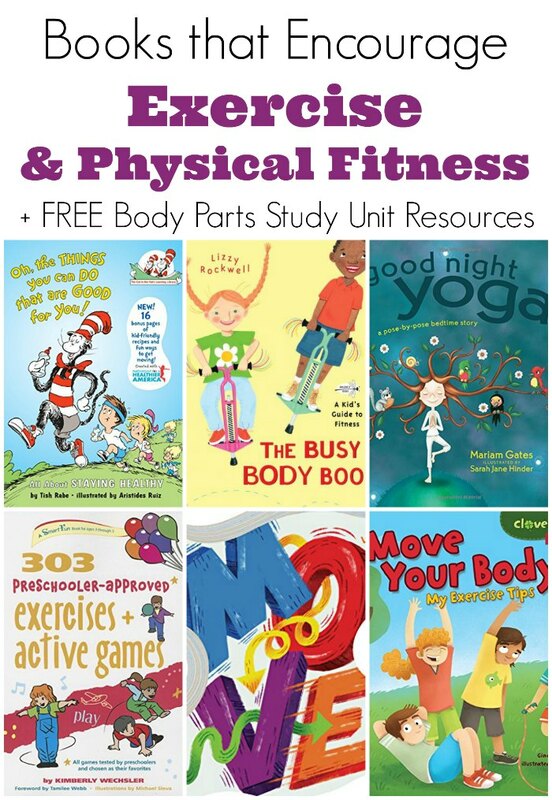 In addition to recommending children’s books about exercise and physical fitness, I’ve teamed up with some fellow bloggers to offer you homeschool and in-class unit study resources to teach kids about their body and keeping it healthy! Some of these resources may contain affiliate links. Exercise is so important! I am glad books are still being made about it! My kiddos will love these!!! Thanks so much for sharing these with us! Such great book suggestions! Pinned. Lovely suggestions. My daughter is going to love these books. Wow! This is a good list of book to support children stay and get active. It is really useful for children to know how important fitness and exercise to their health. Thank you for your post.